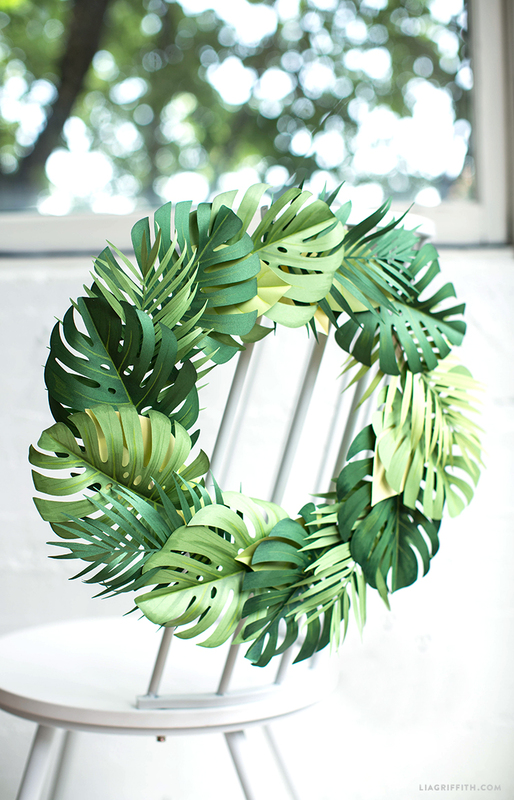 Keep summer going strong with this outstandingly gorgeous paper monstera leaf wreath. This DIY decoration is fun and super simple to make. Plus, thanks to our friends at Paper-Papers, we are giving you this pattern for FREE! If you’ve ever wanted to get into summer crafting, now would be the time! All you have to do is visit Paper-Papers website to download either the SVG or PDF files, then cut. 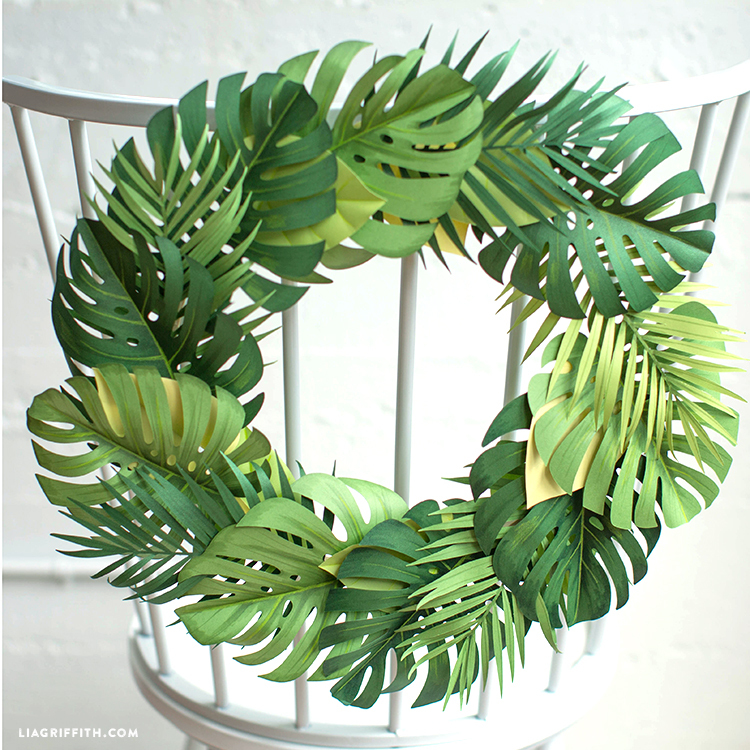 Finally, follow along with our photo tutorial below to learn how to assemble your paper monstera leaf wreath. For this cool leaf wreath, we used Paper-Papers French POPTONE and metallic text weight paper. We are absolutely in love with these papers for our summer crafts! POPTONE offers the perfect thickness to remain firm yet malleable and is super fun and bright. Metallic is perfect for any summertime flower, with a shimmery finish and frosted texture. To discover your own perfect paper, browse Paper-Papers’ wide selection here. Cut and score leaves out of various green paper: Our wreath has 9 monstera leaves (“Botanic” & “Gumdrop Green”), 5 palm fronds (”Botanic,” “Gumdrop Green,” & “Sour Apple”), and 7 anthurium leaves (“Sour Apple” & “Banana Split”). 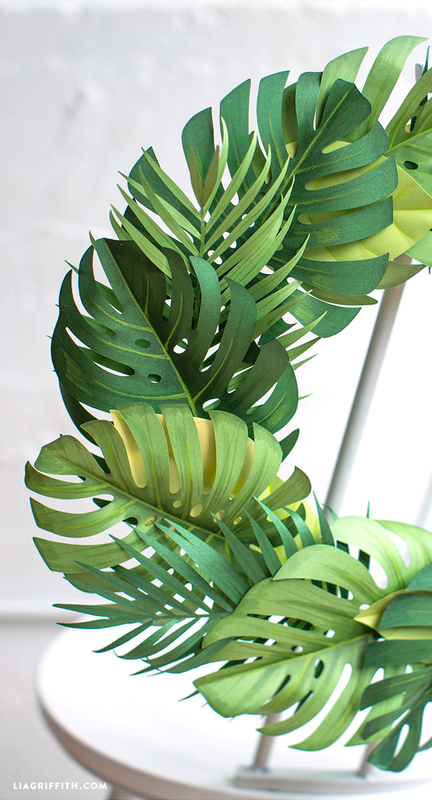 Fold the monstera leaves in half along the score line. Shade details with the green art markers, going from the middle outward, and from the edges of the leaf inward. Let leaves dry. Draw veins with a chartreuse colored pencil. Curl the leaf outward from the centerfold slightly. Shade the palm fronds down the middle, and lines through the leaves. Flip over and glue a length of 24-gauge floral wire to the back (for stability). Fold the anthurium leaf in half. Draw the veins on along the score lines with a chartreuse colored pencil. Curl the edges under. Glue the finished leaves onto the wooden embroidery hoop, moving in one direction. We used just the outer piece of the hoop and made sure to cover the screw part. Alternate leaf type and color for variety. You can even glue some smaller leaves to the underside for more depth and bend the palm fronds slightly. Tie a bit of twine if needed on the back for hanging. Join Us For More Summer Fun!